Some advocates argue that a basic income should be financed by “helicopter money” — the printing of new money by central banks for direct distribution to individuals. To be sure, the policy is contested, even among basic income supporters. Many suggest redistributive policies to fund a basic income, as opposed to the creation of new money, and some have vocally opposed helicopter money. However, while basic income advocates might argue about the advisability of printing new money, the European Central Bank (ECB) has pressed on with its decision to do so: under the Quantitative Easing (QE) program, which ECB President Mario Draghi initiated in March 2015, the ECB been creating €60 billion each month. The ECB then uses this money to purchase government bonds, primarily from private institutions. The question at this point is not whether to print new money, but what to do with it. Many economists have worried that QE has been ineffective. Although the policy is meant to stimulate the economy (in particular, inflation), detractors contend that it has done little to spur economic growth — while, meanwhile, poverty and inequality have increased, and inflation remains very low. The Quantitative Easing for the People campaign holds that, rather than being given to banks, “the money created through QE should be spent into the real economy so that it can benefit individuals and society as a whole.” For example, the money could be distributed directly to individuals, as in helicopter money. On June 17th, QE for the People announced that a group of 18 Members of the European Parliament signed an open letter to Mario Draghi “calling on the ECB to study the viability and implementation of helicopter money.” Signatories include MEPs from the Left, the Greens and Socialists. The letter puts forward two proposals [as alternative policies to QE], including a ‘green quantitative easing’ plan and the so-called ‘helicopter money’, a mechanism by which central banks would distribute money directly to individuals. It was co-signed by MEPs from 11 countries of the EU, including representatives of the Socialists and Democrats, the Greens, and members of the European United Left/Nordic Green Left groups of the European Parliament. In March, Draghi called helicopter money a “very interesting concept.” Nonetheless, the ECB was not considering it. 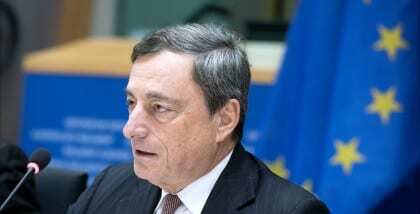 The letter from the MEPs urges Draghi and the ECB to reconsider. The complete letter, as well as the list of signatories, can be found on QE for the People’s website. QE for the People is supported by multiple basic income advocacy groups, including Unconditional Basic Income Europe, Mouvement Français pour un Revenu de base (France), Runder Tisch Grundeinkommen (Austria), and Rendimento Básico Portugal.